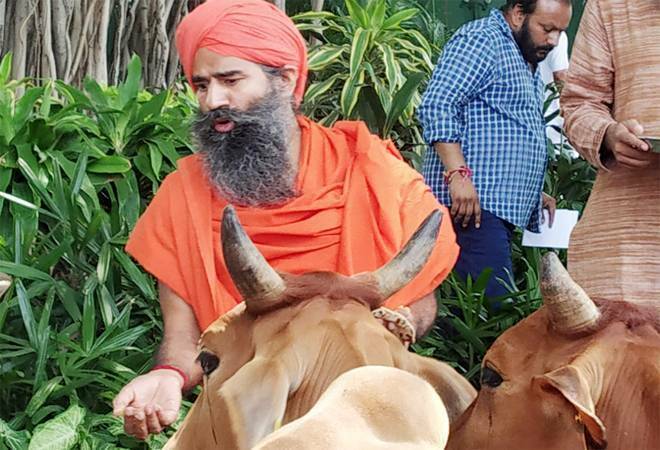 The founder of the company, Baba Ramdev, is targeting sales to the tune of Rs 1,000 crore by 2020, and daily sales would be around 10 lakh litres. Though the early part of this year saw the French yogurt maker, Danone, exit India, the last couple of months have been action-packed for the Rs 100,000 crore Indian dairy industry. While Parag Milk Foods acquired Danone's milk production facility in Punjab, global dairy major, Fonterra, re-entered India by partnering with the Future Group. Fonterra had partnered with Britannia a decade ago, which had hit a roadblock. Britannia has launched its own milk collection centre near Pune, while ITC Foods, apart from announcing its entry into milk based beverages, also launched liquid milk in Bihar under the brand name, Aashirvaad Svasti. The newest kid in the block is none other than Patanjali Ayurved. As always, the FMCG upstart has an ambitious plan for dairy too. The founder of the company, Baba Ramdev, is targeting sales to the tune of Rs 1,000 crore by 2020, and daily sales would be around 10 lakh litres. The yoga guru-turned entrepreneur also claims to have their own collection centres and chilling centres across North India. Just as it did with its other products, Patanjali Milk would also be sold Rs 2 lesser (Rs 40) than the MRP (Rs 42) of other brands. A procurement of its own will surely help the company in scaling up the business and ensuring quality. Most of the recent dairy entrants have realised that procurement is key to success in India, and have been investing on procurement facilities. But will Patanjali have an edge over ITC or Nestle in the dairy business? R.S. Sodhi, Chairman, Amul, gives a safe answer by saying that any company with a good enough distribution might and their own procurement system can be successful in the dairy business. "If more organised players come in it will be good for the industry and for the farmers." But in the case of Patanjali, the concern is that their foray into multiple categories could lead to a loss of focus. In fact, the company, after growing exponentially in the past few years experienced flat growth in the last fiscal. Though Ramdev and his Co-Founder, Acharya Balkrishna, blame it on economic policies such as GST, FMCG experts believe that a lot of the flat growth has been due to their entry into too many categories and consequent dilution of focus. Patanjali's sales in several modern retail stores have dipped and one of the major reasons for this has been the controversies around the quality of their products. In fact, the company, which was known to be dictatorial with retailers is reportedly caving in to their demand of selling their products at deep discounts. Patanjali will definitely have to work harder to make a dent on competition growth in the dairy sector. Talking on why the dairy sector has been the centre of action, Sodhi of Amul says, "Dairy has become attractive to the private sector as the price of raw milk has dipped by Rs 6 to Rs 10 in the last couple of years. The prices have gone down, but the production has increased and consumption has also increased." However, this situation says Sodhi, may not last for too long. "The milk powder exports had gone down but with several State Governments giving export incentives for milk powder, the unused inventory will reduce and the farmers will get paid more," he adds. The good news certainly is that with more companies entering the fray, the consumer will be spoilt for choice.